We all know there are many many places that don't treat us well, and I would be here all day if I listed them. Besides - who wants to know where not to go? I'm going to make one particular exception here as I have been asked about gluten free afternoon teas a fair bit recently, and I've had two very different experiences, and one helps shed light upon the other. Let's start with the negative. Do not go to the gluten free tea at the Ritz. Unless you like being really disappointed. And being treated like a second class citizen. And feeling nauseous afterwards. Well, it was more greasy-mouthed. Either way. It was unpleasant. Don't go. The "sandwiches" were not the delicate sandwiches of ye olde afternoon teas past; more tiny bits of gf bread with great lumps of (low quality) ingredients plopped on top, the ratio entirely off and quite frankly, bizarre. Who on earth wants to eat six slices of cheddar on top of one little piece of buttered bread? Or indeed, what seemed like an entire cucumber? Or several pieces of dry chicken on top, with no other ingredients to speak of? It was appalling stuff - you would make far far better in your own home. In fact, after trying each one, odd dissapointment after odd disappointment, I stopped eating them. Not because I wasn't hungry, but because it was actively unpleasant to eat. Especially the plain (low quality) mound of smoked salmon on top of that poor defenseless scrap of bread. Please sir, may I have a lemon? A tiny bit of dill? A daub of cream cheese for the lady? Anything more than three measely ingredients? There was the distinct air of "Aren't you lucky that we even have anything to feed you". Dreadful. My sister's vegetarian option contained lovely little sandwiches. And when she was presented with a selection of cakes I received...... A fruit plate! Oh yes, a fruit plate! Lucky me. How delightful to watch my sister stuffing scones with clotted cream into her mouth (sorry sis, just jealous) while I poke at my drab (unripe, tasteless) melon slices. Hey, I did get a macaroon (medicocre) and a cake (dry and tasteless). Again, lucky me. It really is the epitome of what I detest in the restaurant world, when dealing with us gluten free folk. I was paying the £50 like everyone else, but I'm supposed to put up with merely "something I can eat". Yeah, that's fine on a plane. But not at the Ritz. I mean come on guys, seriously? Buck up. And on another note; the service had the outward appearance of being smart, but was actually flawed - I was interrupted as I greeted my sister, and when I gave her her birthday gift. And they loitered. And were often confused about what food was mine and what was hers . In case you didn't have enough reasons not to go. It was a special occasion, thoroughly disappointing, and I hope that all of you avoid this fate. Instead - may I suggest you go to Claridges! Hey! What about the gluten-free tea at Fortnums and Masons? I saw their menus on their website the other day and it looks promising..
Firstly just to say: your blog is great! I have been searching for something like this for a while now! I've found it very helpful and informative :) I'm not a coeliac myself but my sister is and it's hard to find places where we can both have an enjoyable meal (like your sister I am a vegetarian!) Is there anywhere you suggest that is on a budget ( < £10 per person) as I'm a student and can't really afford Claridges! I'm not sure where in London you are located but I can recommend a few places that are good for both, that my sister can enjoy together. Veggie restaurant with GF marked on the menu, mains under the £10 mark. It is also super yummy. I might post about that actually! There is also Simply Vegan in Kentish Town - It is ALL gluten free and vegan - I have yet to try it so I can't comment on the taste front but it's also on budget. Oh. This is very much in keeping with the receptionist's tone on the phone yesterday: unpleasant. Thank you so much for this tip. This just ratified my negative impressions about the Ritz! Back in October I booked a table for Afternoon Tea in December, as I have a dear friend visiting over Christmas, and she's never been to London before. Everything felt wrong from the start! The not-so-friendly receptionist on the other side of the phone, the lack of availability (yes, it's Christmas and it's The Ritz! ), and to top it all an additional £20 per person during December, what for? For a glass of champagne and people singing carols!!! Despite all that, I went for it and booked it, just to realise that you have to provide your credit card details when booking, and if you don't stick to their cancellation policy, they charge your card in full! Having negative feelings of what was supposed to be an evening to look forward to, I started reading more reviews about Tea at The Ritz, and like you found that they use cheap ingredients in a typical mass catering style and the service isn't great either. So I found booked a table at The Langham Hotel (without having to give my credit card details!) and cancelled my reservation at The Ritz straight away. I normally eat almost anything, but now I'm pregnant, so I hope the people at the Langham follow my current dietary requirements with suitable alternatives. Like Kaylee, I'd like to know which other places you recommend for GF afternoon tea. I'm considering Fortnum & Mason. Claridges is fully booked for the date we are looking at in January. DH was going to book a birthday tea for me this week, and as I should avoid wheat, Gf is the best option. He initially booked the Ritz, but when I said "oh dear", he called them back and cancelled. The lady said that they DO have GF cakes, and the plate of fruit is for diabetics. But that demonstrates lack of continuity, as the sandwiches were GF, weren't they, so why would you suddenly have become diabetic? We are going to try the Savoy on the 17th, so fingers crossed. Thank you for this blog, by the way. F & M is FANTASTIC ! Full gluten free menu for afternoon tea - lovely long sitting (not timed and restricted to two hours like the Ritz) AND they offered both my gluten free friend and I take home doggie bags for the cakes we couldn't eat while we were there as they'd be wasted otherwise! I've been twice in the last two years and both times were brilliant for gluten free - I can't recommend them highly enough! 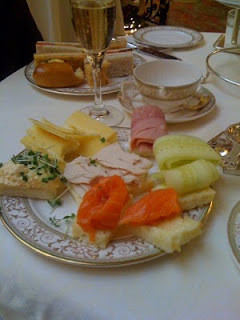 Delimann.co.uk now doing a GF Afternoon Tea, by post folks -newsletter sent yesterday.